There are two main seasons, wet and dry. The wet season runs from June to November and the dry season from December to April but in the months in between, expect weather in transition. And, as in Ontario and everywhere else, expect the unexpected. The hurricane season coincides with the wet season, officially ending in November but most hurricanes don’t know that. Many Europeans travel to Belize in what I would call the off- or low-season, May to December, but from my perspective in south-west Ontario, Canada, there is no place I would rather be than home. You can, however, get some good deals on accommodation. High season is pretty much from Christmas to Easter, and the weather most likely to appeal to tourists and travellers alike is from February to April. You can get less expensive airfares if you can avoid the march-break from mid-March to Easter. 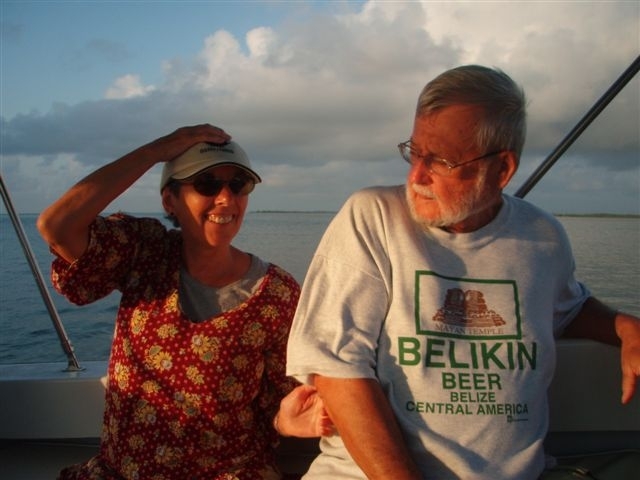 On a personal note, when we first visited Belize 16 years ago, we arrived for our three week adventure in January and spent a little time inland in San Ignacio, south in Punta Gorda, and in Belize City, Dangriga and Hopkins Village on the Caribbean Coast. Though it was hot and humid in the twin towns of San Ignacio/Santa Elena which sit amidst the rain forests, I remember being cold at night and having to cover ourselves with extra blankets; it rained every morning in Punta Gorda and it was cool until the sun burnt off the morning mist; and on the coast, I recollect that even though it was hot by our standards in Ontario at that time of year, we frequently went out wearing jeans and long-sleeved shirts. Once in our early years when we spent 5 days at Gale’s Point on the coast, again in early January; it was cold (low to mid 70s F), so cold that we had to wear long pants and the coats we had worn when leaving Toronto. As the years passed, the length of our visits increased and the date of our departures got later in the new year because we had noticed that February and March suited us better, weather-wise. Now we visit for 2 months at a time, leaving early in February and returning home in the first week of April. There is nothing scientific about this, just personal observations. And because we are retired, we have the luxury to pick and choose, which you might not have. Too soon to be making plans? Better learn what you can now and plan later, just don’t let your chances to travel slip away. This entry was posted on Thursday, June 7th, 2012 at 6:54 pm	and posted in adventure, Travel. You can follow any responses to this entry through the RSS 2.0 feed. Well here I am and reading your blog just like you told me to do. Very nice and I did not know that they give the temperature in Farenheit.